We know it takes a lot of guts to pop the question, especially when it's done in public, but what we can't understand is what in God's name these people were thinking when they got down on one knee. These are some of the most cringe-worthy, awkward proposals that have ever graced the Internet. What happens when a marriage proposal goes off the rails? Some of these awful proposals were even aired on live television. Yeah, that actually happened. The reactions are immense and shocking, and the aftermath makes your heart break and your stomach twist in pain... from laughing so hard. 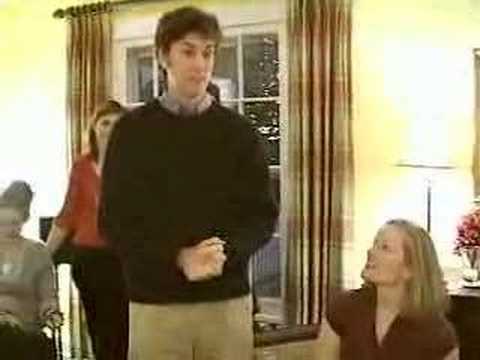 Vote up the most humiliating, hard-to-watch, most awkward marriage proposals ever. These poor guys didn't stand a chance. It's an Irish tradition that on the 29th February of a Leap Year, women are "allowed" to propose to the man. This girl, who's been dating the bloke for two weeks (is that longer in Irish time?) decides takes advantage of this tradition. I mean c'mon, she'll have to wait four more years otherwise, right? Protip: Wait at least a year and half before you propose. That leaves plenty of time for all the crazies to come out before either of you need to decide whether you can live with those crazies for the rest of your life. Apparently, she didn't like the answer the guy gave her because she screams, throws down the ring, and shoves him. This guy must've seen the crazy a comin' from a long ways off. This guy never had a chance. This guy chooses the MALL to propose, like ya do, when you're looking for the creme de la creme of romance. Right off the bat, this guy is struggling, unable to articulate what he's trying to say. You had me when you said hello. I mean, after I said hello. I mean...wait, what did I just say? But let's give the guy some slack here. Who knew a train would come barreling around the corner, pumping "take me where I wanna go," through its high quality speakers and interrupting all of the thoughtful thoughts this guy was thinking? It seems like it's not going to get any worse when he begins reading the worst poem in the history of time, until the coup de grâce comes smacking him across the face when she steals the ukulele from the musician behind her and clocks the sh*t out of him, storming off while he lays in a crumpled mess on the floor. The only thing that could possibly go worse for this guy is if he pooped his pants. Yikes. This guy should've taken notes from the last three videos. 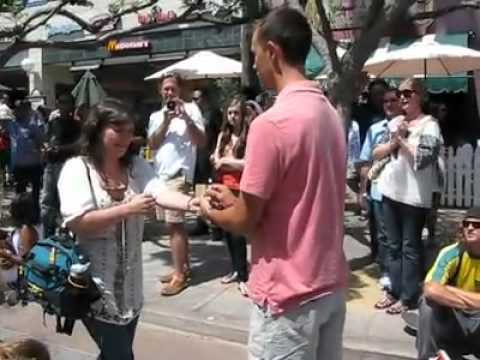 He proposes to this Kristen in the middle of the a busy shopping center (haphazardly, if you ask me), and you'd think when she started backing away from that he'd get the picture, but he wouldn't let up. She flees the scene, crying. Maybe he shouldn't have worn that pink shirt? It doesn't really go with his skin color. There's nothing like getting into the holiday cheer by taking a rejection crap on your wannabe future inlaws's floor. This guy decides the best method of approach in this situation is to blindside everyone. Nothing like ninja surprising the in laws with big, fat awkward turtle to make everyone love you. As soon as he gets down on one knee, her face goes from carefree to completely deflated, dreading the answer she's going to give. She says something to him and walks away, leaving the poor chap chagrined and confused. Maybe he should've breached the marriage subject to her before going for the gold.